Two Chicks On Books: Top 10 of 2014-Top 10 Books I'm looking forward to in 2015! Top 10 of 2014-Top 10 Books I'm looking forward to in 2015! And make sure to stop by my co-hosts sites Reading YA Rocks, Tales of a Ravenous Reader, and Magical Urban Fantasy Reads for their lists! Oh and make sure to sign up with the linky to share your lists! And don't forget to visit my co-hosts lists one of them is hosting a giveaway today but I'm not saying who you'll just have to visit all 3! Ok I’m being a big time cheater here! I’ve read a fewt of these books already but I needed to share how awesome they are on and there’s not a top 10 it’s a top 13! I’ll put READ next to the ones I’ve read lol. 1. FIREBIRD #2 by Claudia Gray, haven’t read. But I need to! I also may know what the it's title may be because Claudia shared it with me but until its official my lips are sealed. But I need more Paul in my life right now!!!! 6. THE RUBY CIRCLE by Richelle Mead, haven’t read. I need this one like a fat kid needs candy!!!! That cliffie at the end of SILVER SHADOWS was ugh so infuriating. And I need more Adrian!! 7. THE DEAD OF WINTER by Kresley Cole, haven’t read. I am dying to get my hands on this finale. I need to know who Evie chooses and I pray it’s Death! 11. SHADOW STUDY by Maria V. Snyder, READ. Maria is my favorite author of all time so of course this one makes the list. And it’s more Yelena, Valek, Ari, Janco, Leif, Kiki, and the rest of the crew! These characters are like family to me! Reading this was like coming home! 12. A COURT OF THORNS AND ROSES by Sarah J. Maas, CURRENTLY READING. I love Sarah's Throne of Glass Series and this new series of hers is going to be just as awesome I'm loving the hot Fae. I will read anything Sarah writes! 13. END OF DAYS by Susan Ee, haven’t read. It’s taken way to long for the conclusion to this series but I’m still dying to read it! Did any of my favorites make your list? 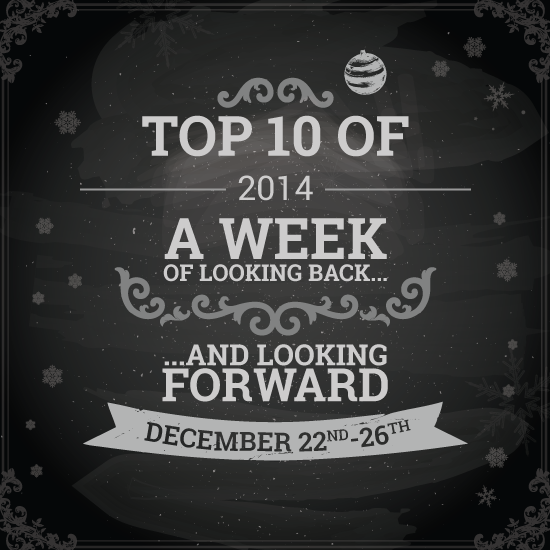 Thanks so much for participating in this year's Top 10 of 2014 it was a blast and we hope to see you next year! Love your list. I am soooo excited for ACOTAR and I'm also dying to read Red Queen and The Cage! Love this list! The Witch Hunter sounds amazing! Super excited for The Ruby Circle! And The Sin Eater's Daughter. I must read Silver Shadows before Ruby Circle comes out..
Ooh, I just realised End of Days is on your list too! I don't have any of the books on my list, but that doesn't mean I'm not looking forward to them. All of the books on your list that are 1st in a series or debuts, I want to read :) The sequels one, haven't started the series or I've gotten behind on it. Thanks for hosting this event, Jaime, I had lots of fun once again. Great list! Red Queen and Shadow Study almost made my list, too. :) I'm really looking forward to The Witch Hunter! I am so waiting for Red Queen! LOVE it Jaime we always seem to like the same books. I am dying to read Sin Eater's Daughter. YAY for Fantasy in 2015!!!!! I love your list! There are some I forgot about! Thank you for hosting this hop. It was my first year participating and I can't wait to do this again next year! Happy New Year!! I'm definitely pumped for Dead of Winter, Red Queen, and Court of Thorns and Roses. Thanks for hosting! OH PFT. YOU READ SO MANY 2015 RELEASES ALREADY. JEALOUS. ACOTAR IS AMAZINGGGGGGGGGGGG THOUGH. TWEET ME WHEN YOU FINISHHHH. I'm starting Shadow Study right now actually >:D CAN'T WAIT TO GO BACK TO MY BBY VALEK. Also SIN EATER'S DAUGHTER. OHMYGOD DYINGGGGGGGGGGGGGGGGG. Btw, Death from Poison Princess. Yes. Hell yes. Stacee from Adventures of a Book Junkie has me wanting to read The Sin Eater's Daughter, in the worst way! !